Club news: Meetings continue at the Chamber of Commerce in Bartlett Parking lot on the second & fourth Tuesday of the month at 6:00 PM. The next meeting is May 8th. The club did a show and shine last Wednesday 4/18/12 at “Get the burger” because the weather was nice, sixteen cars showed up and one motorcycle between 4 and 6PM. It was fun to see everyone and visit and talk about cars again. Cruise nights are every Wednesday at Get the Burger from 4PM until 7PM. The next Yucaipa car show is coming right up and is May 4th. Geoff and I went to the last show and it was great, there must have been 250 to 300 cars. Excellent show. Those going on May 4th will have to coordinate which each other for I will be out of town. The latest on our car show is that Geoff is making more flyers and is getting dash plaques and car registration cards made. We had a 50/50 drawing that collected $42 and Joe Siska won and took home $21. The calico car event was postponed until Sat. May 19th. Don’t forget the Citibank car show on Memorial Day weekend Sunday May 27th, also that weekend is the yard sale at Ron King’s house; bring your donations of sales items. Yucaipa Cruise Night- Starting May 25th- Every fourth Friday from 6 to 9PM- No entry fee- In uptown Yucaipa. Moose car show- Saturday May 26th. Club news: Meetings continue at the Chamber of Commerce in Bartlett Parking lot on the second and fourth Tuesday of the month at 6:00 PM. The next meeting is October 11 2011. Carl’s junior car cruise has now been moved to Get The Burger for the remainder of the season and is every Wed at Get the Burger from 5 to 8PM. 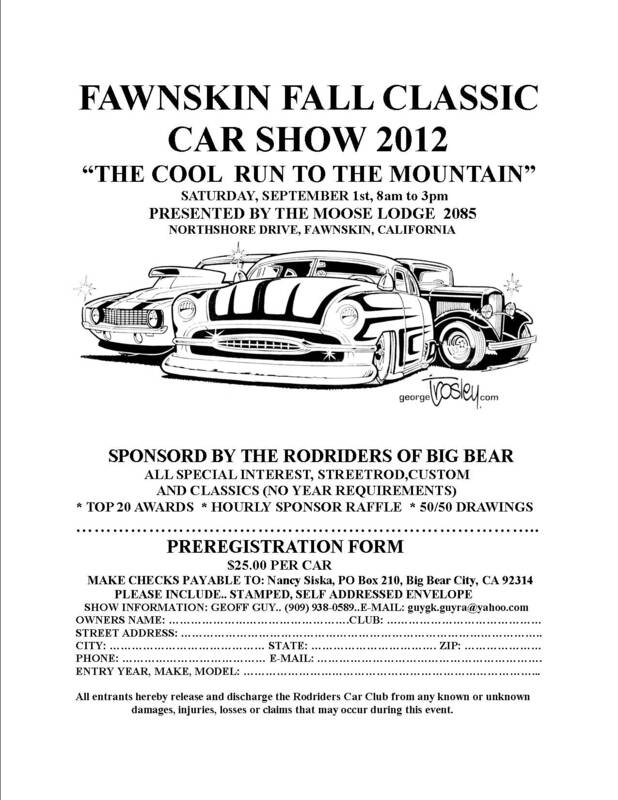 Looks like there will be a large showing of cars this evening 9/28/11- should be a lot of fun. The club is meeting at the Donut Shop in Staters parking lot on Sat from 8AM until 10 am. The T-shirt order is still in work but progress was made at our last meeting, the money for the silk screens and film have been paid for, but before we turn in the order we want to add the Hoody’s and sweat shirts to the existing order. The club finally paid for the art work that was used on our banners and will be used for our clothing order. If you want hoody’s or sweat shirts bring money to next meeting. Halloween in the village is Oct 31, we will have the same space as last year at the intersection of village and pine, and we expect to have a Hearse and the Munster car. Nancy and Joe are buying the majority of the candy to give to the children from Cosco, but everyone should still bring at least (1) bag of candy. Kenny is re-verifying our spot in the village. Next meeting is on October 11th at 6 pm. Many new car shows are coming up please check the list to see if any interest you. We would like to have a large showing of our car club for the Yucaipa car show the first Friday of November which is there toy drive. Please put this on your calendars. Discussion at Sept. 13th meeting about this show and looks like most members will attend. Several members were showing interest in the October Yucaipa Car show which is on October 7th from 6 to 9PM but you need to get there early if you want a spot. Usually we leave Big Bear at 3:30PM and get there by 4:30PM. We have dash plaques left over from our car show so if you want some let me or Nancy know. Club news: Meetings continue at the Chamber of Commerce in Bartlette Parking lot on the second and fourth Tuesday of the month at 6:00 PM. The next meeting is September 27 2011. We met Wed. 21st of Sept. at Get-the-burger ,with owner Eric Swartz providing us with music and car hop service. Coned off parking on the elevated lot facing Big Bear Blvd was ideal for spectator view. We will continue meeting there each Wed .from 5:00 to 7:00 weather permitting. T-shirts order are in work and Kenny is bringing info on how we can get this started at the next meeting. Halloween in the village is Oct 31, we will have the same space as last year at the intersection of village and pine, we expect to have a Hearse and the Munster car, please start thinking and planning for the candy we will need. Nancy and I will stop at Costco to price the candy compared to buying direct from Hershey’s. Next meeting is on September 26th at 6 pm. 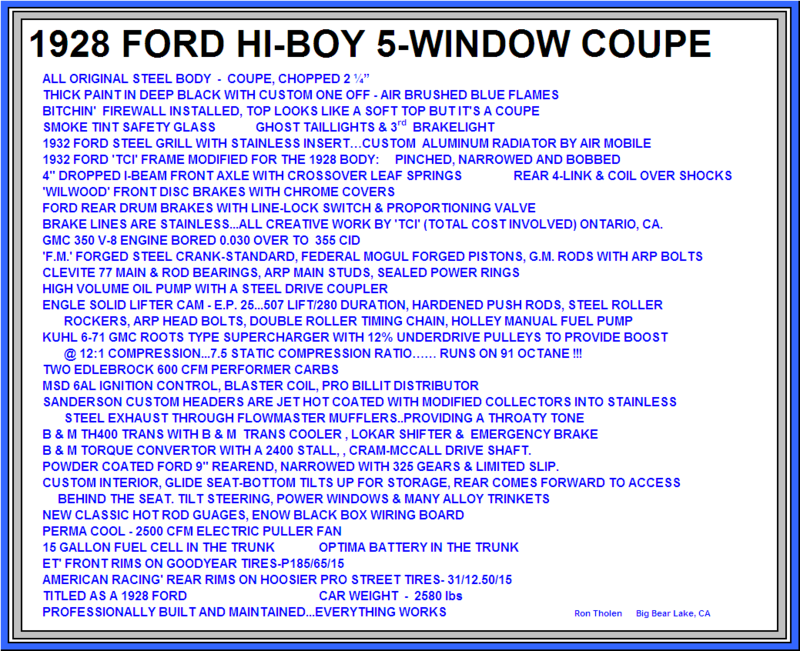 Many new car shows are coming up please check the list to see if any interest you. We would like to have a large showing of our car club for the Yucaipa car show the first Friday of November which is there toy drive. Please put this on your calendars. Discussion at Sept. 13th meeting about this show and looks like most members will attend. Theme: Talk about cars, socialize and have fun. PM. The next meeting is June 14th at 7 PM. Be aware that meeting time is now 7pm. event, I will be out of town but others in club can coordinate the run. in Big Bear by Rhodeshow are cancelled for this year. Do not forget to look for stuff to give for Pause for Paws Yard sale, please take stuff to Ruthann Guy on May 26. Also bring baked goods for bake sale. Jr from 5 to 8PM. Today should be a good showing wed May 25th. 8AM and parking on the plaza end of the parking lot. we need to make 5 gallons, and club will pay for ingredients from treasury. some help working on her car. Court. Everyone start looking for stuff that you can donate for the cause.